How Do Red And Giant Pandas Coexist? The Secret Is In Their Skulls. Red pandas and giant pandas have more in common than simply being equally adorable and included on the IUCN Red List. They both eat bamboo and live in the same habitats. How do they coexist without competing over the same resources? The secret might be hidden in their skulls. Despite their English language labels, red pandas (Ailurus fulgens) and giant pandas (Ailuropoda melanoleuca) aren't very closely related, being separated by some 40 million years of evolution. Red pandas are more closely related to the skunks and raccoons you might find in your own backyard than the giant pandas with whom they share habitats in southern China. The giant panda, on the other hand, is a much larger bear. Both species have become adapted to a diet mainly consisting of the same species of bamboo, something fairly unique among Carnivorans. In a new study published in Biology Letters, researchers set out to determine how the two species can both rely on the same food sources in the same places. What's puzzling according to Z. Jack Tseng, a postdoctoral fellow at the American Museum of Natural History's Division of Paleontology who ran the study, is that a fundamental tenet of ecology holds that if two species utilize the same resources, they can't live in the same space, because there would be too much competition. But a closer look reveals that they're actually eating different parts of the bamboo. Red pandas prefer leaves and fruits, while giant pandas munch on trunks and stems. It turns out that those preferences are reflected in their skeletal anatomy. Skulls of each species were CT-scanned and reconstructed in three dimensions. Those models were then used by the researchers to simulate different forms of biting and chewing. They found that red panda skulls were better and distributing the stress of chewing than giant panda skulls. But the giant panda compensates by having a stronger skull that can withstand the impact of repeated, concentrated, localized forces. At first glance, the two skulls in the video above are indistinguishable. The only apparent difference is the size of the species, not the shape of the skull. But the biting simulations reveal that the red panda's skull endures much more stress than the giant panda's does. The colors represent stress magnitudes, blue representing the skull and jaw at rest, and red representing areas of stress during the biting event at the right-side canine tooth. 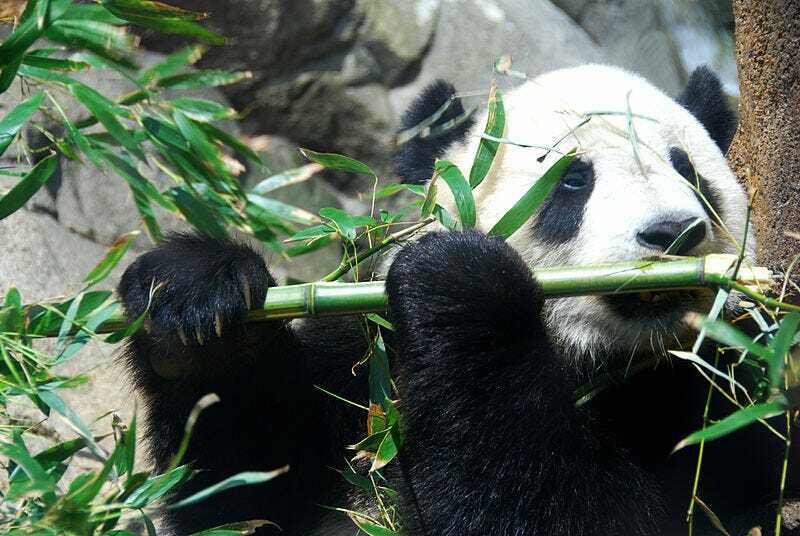 "The skull of [the giant panda] is more capable of exerting high peak forces to break bamboo trunks and stems, and to resist the stresses generated, during short and discrete periods of time," the researchers write. By contrast, the red panda's skull "is better able to resist fatigue as a result of constant chewing applying submaximal forces over protracted periods of time by distributing stress more evenly." These differences explain how the two species which, on the surface, shouldn't be able to coexist, can get along just fine. "This research contributes to the body of work showing how the pandas co-exist," Tseng said in an official statement. "We've found that fundamentally, based on the structure of their skulls, they cannot eat the same things." Rather than keep to their own habitats or evolve to eat different foods, the two species found an engineering solution to their problem, allowing them to live together in the same forests. Images: Red panda via Wikimedia Commons/Jar0d; giant panda via Wikimedia Commons/Fernando Revilla.